Intra-workout supplements are one of the newer supplement catergories on the market. These formulas are generally based on ingredients that fuel muscle growth, provide energy and support endurance during a workout. In addition, the can prevent muscle catabolism during exercise and reduce post exercise muscle soreness, for a fast, complete recovery. 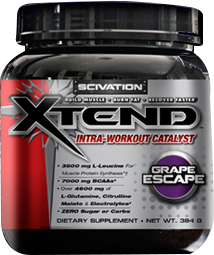 Scivation Xtend was the original intra-workout and it has remained at the top of the market. Optimum Nutrition is one of the best known sports nutrition brands in the world, and originally produced Amino Energy as a simple pre workout. It has since been adopted as an intra workout by a number of people. Let's take a look at how these two products stack up. Most intra-workouts are amino-acid based, and these two products are no exception. Scivation Xtend contains the three branched chain amino acids, leucine, isoleucine and valine, alongside glutamine These aminos are known to prevent muscle breakdown, encourage the formation of new muscle fibres, and enhance recovery. These ingredients are joined by an electrolyte blend, to replenish losses through sweat and maintain optimal muscle activity, citrulline malate, which increases blood levels of arginine for pump and blood flow, and vitamin B6, for efficient metabolism of glucose and fatty acids. 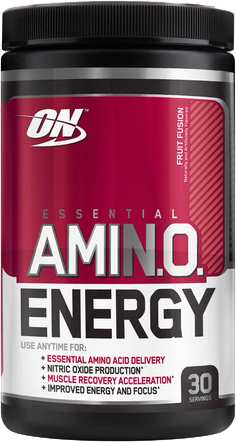 Amino Energy has a wonderfully descriptive name, as it provides both amino acids and energy. In spite of this simplicity, the formulation is more complex than Xtend. Like Xtend, Amino Energy provides BCAAs and glutamine, but throws a number of additional amino acids into the mix. Taurine is a versatile amino which supports working muscle cells, arginine and citrulline enhance blood flow and pump, tyrosine is a precursor to many neurotransmitters and may enhance mental focus, and beta alanine is a cell buffer that promotes endurance. On top of this, Amino Energy includes small amounts of other essential amino acids, deficiency of which can be rate limiting in protein synthesis. On the energy front, Amino Energy goes for some tried and true ingredients, combining caffeine and green tea extract with green coffee bean, which can aid metabolism. Winner: Amino Energy. Both formulations contain everything needed for muscle building and recovery. Although it lacks electrolytes, like Xtend, Amino Energy goes that little bit further with a more extensive ingredient blend that is suitable before and during a workout. One of the perils of having a lot of ingredients is that they are generally included in smaller doses, and Amino Energy is no exception – each 7g serving contains all the above aminos packed into a 5g proprietary blend. This makes it difficult to know individual ingredient dosage, but it is safe to say that many ingredients, including BCAAs, taurine, and glutamine are underdosed. Unfortunately, at 160mg, the proprietary stimulant matrix is seemingly well dosed, so simply taking a double dose of Amino Energy may leave you with a case of the jitters. On the other hand, Xtend's simple formula is transparent. We know that the 7g BCAA matrix is dosed in the physiological ratio – two parts leucine to one part isoleucine and valine – and complemented with a healthy 2.5g of glutamine and 1g citrulline. Winner: Xtend. This is a simple supplement which does less, but does it well. Although they contain similar ingredients, Amino Energy and Xtend do fill slightly different roles. The presence of essential aminos in Amino Energy imply that this supplement is designed with protein synthesis in mind and the stimulant matrix maintains focus during an extended session. The electrolytes in Xtend are more suited to optimising a workout and enhancing recovery. While both supplements are likely to be effective, dosage is an important concern. Winner: Xtend. There are many people who will prefer the intensity of Amino Energy, but we cannot argue with the dosage and formulation of Xtend. Those people who like Optimum Nutrition products but want something a bit simpler may be interested in BCAA 5000, which contains nothing but high quality, instantised branched chain amino acids in the 2:1:1 ratio that many believe is optimal. This is an incredibly hard choice. Xtend and Amino Energy are two of the best tasting supplements around, and regularly smash the competition in the rankings. Both mix well and come in a massive range of flavours – seven for amino energy and nine for Xtend. Winner: Xtend. Scivation reformulated this product and the flavour improved dramatically - this is the sort of behaviour we like to encourage! You can't go wrong with either of these, and you'll never get bored with such an extensive range of flavours. There are a number of ways to work out value of a supplement. These two products are different enough to benefit different types of people, so the real question of value lies in whether or not the supplement has met or exceeded expectations. Price weighs into this, but often secondarily, when the differences are small, as they are in this case. When the largest size tubs are purchased, one 9g serve of Amino Energy will set you back $0.85, while a 14g serve of Xtend costs $1.00. Intra Workouts are defined by BCAAs. While we don't know the exact quantity in Amino Energy, if we imagine this to be 3g, we are playing about $0.28/gram, while Xtend sets us back just over $0.14/gram of BCAAs. Winner: Amino Energy. It is the more versatile supplement and slightly cheaper per dose, although both of these products represent great value. If a strict BCAA based intra workout is what you're after, Xtend is the better value choice. Xtend Endurance is an excellent product which, unlike sugar free Xtend, contains carbohydrates to support the energy requirements of endurance athletes. This is a great product which has been readily adopted. On the other hand, Optimum Nutrition's Amino Energy Chewables are a fun way to get essential aminos, but they have a low dosage, and compared to Xtend Endurance, have limited appeal. Winner: Xtend Endurance. This is a great product for serious endurance athletes. Winner: Scivation Xtend. While Amino Energy is a very versatile product that packs a lot in and is great before and during a workout, Xtend is solidly formulated, very well dosed, and the quintessential intra-workout formulation.